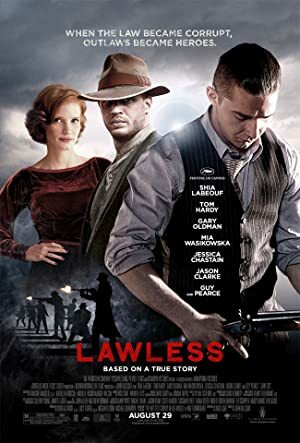 Lawless (2012) – What's New on Netflix Canada Today! In 1931, in Franklin County, Virginia, Forrest Bondurant is a legend as immortal after surviving the war. Together with his brothers Howard and the coward Jack, the Bondurant family has a distillery and bootlegging business. When the corrupt District Attorney Mason Wardell arrives in Franklin with the unscrupulous Special Deputy Charles Rakes, the Bondurant family refuses to pay the required bribe to the authorities. Rakes pursues the brothers and unsuccessfully tries to find their distillery. Meanwhile Forrest hires the waitress Maggie, a woman with a hidden past in Chicago, and they fall in love with each other. Jack courts the preacher’s daughter Bertha Minnix and deals a great load of alcoholic liquor with the powerful gangster Floyd Banner. Jack shows off in Franklin attracting the attention of Rakes that finds the location of their distillery. When he kills the crippled Cricket Pete, the locals join forces to face the corrupt authorities.